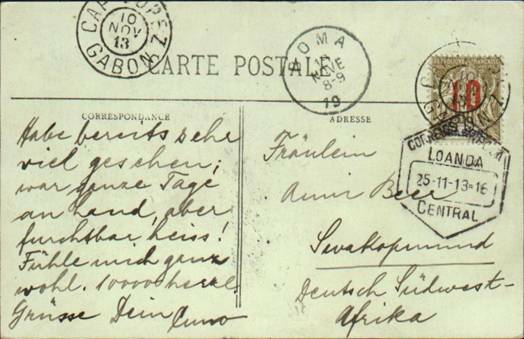 This article looks at a small part of Belgian Congo philately and concerns letters that are not from the Congo, not to the Congo but have been routed via the Congo on the way to their final destination. 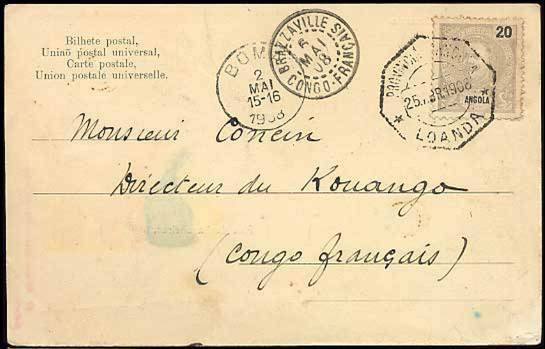 Some bordering countries of the Belgian Congo, chose to route their mail via our colony to minimise time in transit, as the communication network (rail, boat and airmail services) of the Congo was more highly developed than their own. 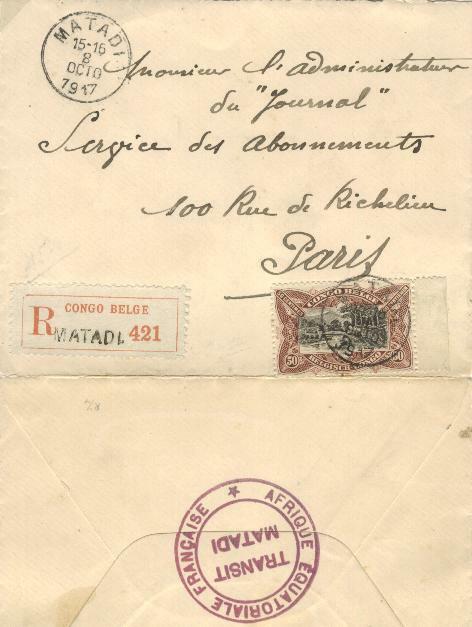 Some mail also bears a ‘Boma transit mark’ because to get to its destination it was necessary to use a paquebot of the “Compagnie Belge Maritime du Congo” (CBMC) calling at Boma. 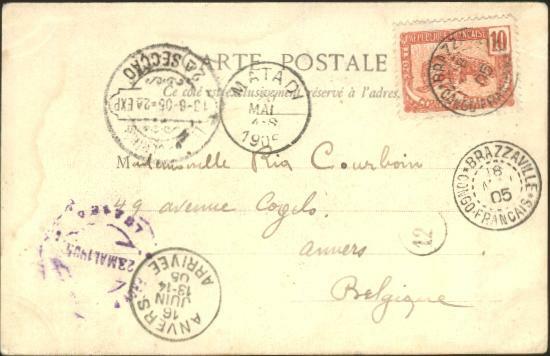 In some cases other shipping companies or ports of departure were used and the mail for Anvers transferred to them by ‘coasters’. I am going to illustrate this with some scarce covers (seen or bought) from between 1886 to 1918. It is not easy to find such covers because they are filed away in dealer’s boxes, not as Congo material but under their country of origin. However and fortunately modern day computer technology helps in sourcing such material on auction websites. Société Diamang / Dundo / Angola - mixed franking Angola + Belgian Congo airmail stamps for the flight from Tshikapa to Europe. - transit via Léopodville for the airmail service to Europe and the USA from bordering colonies such as Angola, North Rhodesia, French Equatorial Africa. 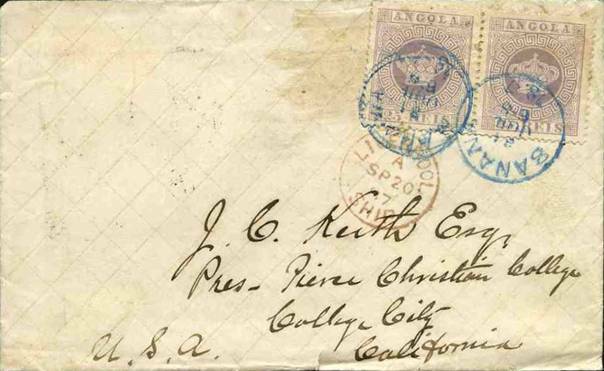 Curious cover, probably transferred by hand. From French Equatorial Africa to Paris. 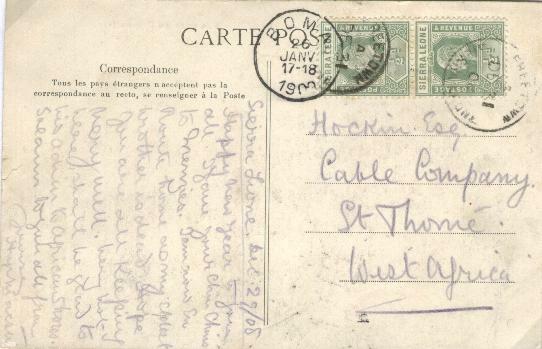 Routed via Matadi for franking and registration, on October 8th 1917 during WWI. I am lacking in both knowledge and sufficient reference books about maritime postal mail to provide full travel details. During this period Belgian, English, German and Portuguese shipping lines provided services for passengers, merchandise and mail to and around Africa. 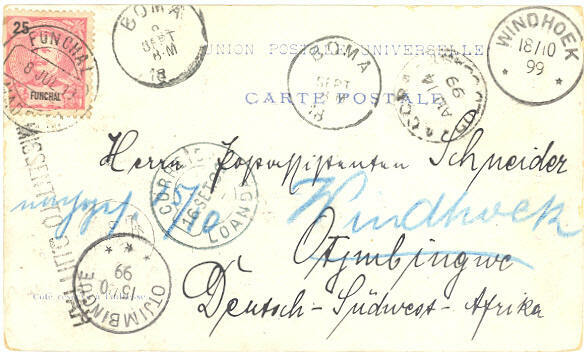 Good luck to anybody who can explain the postal routes used with so few postmarks on such covers. Boma and the Belgian Congo can be seen as a transit point for African mail en route to its final destination.